What needs to be said about this season? 3-13. That is all that really needs to be said. How about this….7-25?!?!? I know there are a lot of items the Jacksonville Jaguars truly need to review. What we are going to go over in this article are the five items that are important to me….a fan. Like a lot of you reading this, I do not work in football nor do I work for the team. There are things I feel are important and, obviously, the team should read my article and listen to just me! I thought I was going to save this for last but I like this topic. It is a popular one with fans off all degrees of interest. A lot are expecting him to come back and be the beast we all expect him to. Most people think he is not going to be on the team and we should drop the topic. Others still hold out hope that he will show up and contribute. Where am I? The last one. I want him to take care of himself first. If he does not do that, then we have nothing anyway. If he has gotten past his vices and demons then he may be able to contribute to this team in 2015. I really like what GM Dave Caldwell said about the topic. He said there is “no downside to keeping Blackmon on the roster” and that he considers the wide receiver’s return a ‘luxury.’ I agree 100%. There is absolutely no reason to cut him. Let him apply for reinstatement and then bring him in to see where his head is at. He is still under contract and, if he is in a good mental place, could be a valuable piece to the team. Your hope as an organization, teammate and a fan is that he has learned from his mistakes and is ready to show it. What do you think the 31st ranked offense in the National Football League should work on? In taking a look at Olson’s track record, wherever he was the quarterbacks played well and they did so quickly. He has a good offensive mind and has been on horrible teams for the last 3 years. Let’s hope this is his chance to shine with another young quarterback and a talented group of receivers. The one thing this team does have is youth with experience. The offense, at times, last year started six rookies including quarterback (and face of the franchise) Blake Bortles. The new offensive coordinator will have a young and talented group of receivers headlined by Allen Hurns and Allen Robinson. Marqise Lee made a name for himself toward the end of the 2014 season and showed us that we could have a hell of a group. Running the ball has no big name. RB Denard Robinson showed some flashes and finished with the team high 582 rushing yards but second on the team list was, you guessed it, Bortles. It will be nice to see Toby Gerhart get some carries that count when healthy as we saw towards the end of the season. No matter what, the offense can only improve…..right? I mean, Bortles got the start to gain the experience and the receivers now have a better understanding of the speed of the game. Greg Olson has to be grinning from ear-to-ear. I am not a coach but wouldn’t you look at this young group and get excited about the potential? It sounds so easy, right? As I mentioned above, the Jaguars are 7-25 the last two seasons. That is the definition of NOT WINNING! I can give you the “I am a true fan” speech. I can tell you where I was in 1993 when it was announced that the city of Jacksonville was awarded a team. I can also tell you how I felt in our second year of existence on that amazing run through the playoffs. I have a video somewhere of my mother and I inside the stadium waiting for the team to come back from Denver (getting chills now thinking about it). You know what made that year special? Winning. Now is the time. I know we have some issues to overcome. I know we have a young team. Those young guys have experience though and that experience needs to show this upcoming season. You know 2014 is the first time since 2011 that we won more than 1 home game? We won 3 games this year and all of them were at home. 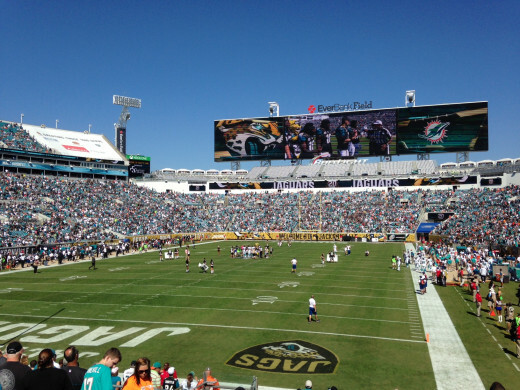 EverBank Field was rocking during those games. I just want to keep that feeling going. This team needs to produce the wins that we have been promised. It is not up to us, though. The team has to take the reins. QB Blake Bortles needs to lead this team. The offense needs to show up to more than four games a year. The defense can build on their success from last year. Once we get the offense going, this team will get back to the playoffs. Did we lose more games in 2014 than the previous season? Yes. Did we see more growth this year? Yes. The table says it all. Point differential has been horrible and, obviously, in the negative for quite some time. This needs to turn around this year. With that being said, not only do we need to start winning but we need to start winning important games. First, we need to win in the division. We are not in a good division but winning it still gets you in the playoffs. Based on this year alone, we are better than the Titans and we are right there with the Texans. Between these two teams next year, our record should be 3-1. Indianapolis, right now, is the team to beat. They have the quarterback of the future. Our defense kept them in check for at least one half both games. We are closer than many think in the division. Second, we need to win in London. The experience is amazing as my wife and I went to the game last year (click here for that article). We have a big fan base there and now is the time to reward them. By the way, we play the Bills. We have their former head coach on our staff this year so it should be fun in more ways this time around. The owner Shad Khan wanted the opportunity to build a brand. What better way to help cement the Jaguar brand by truly being the home team and winning at Wembley. Next, win on the road. I am not saying we need to win them all this year, I am just saying stop being the punching bag of the league. Jacksonville will travel to Tampa Bay, New England, New Orleans, Baltimore and New York to face the Jets. We absolutely have to win games on the road to be taken seriously and to show we are moving to the next level. Last, but not least, we need to win to have consistency. What do I mean? The Jaguars have had 4 head coaches in the last 5 years (yes, I did count Mel Tucker). If the team does not win more games this year, we may be looking at 5 coaches in 7 years! That is it ladies and gents. I just outlined my top three stories for our Jacksonville Jaguars. We are 70 days away from the draft and 20 days away from free agency. As usual, what we do in free agency will dictate what we do in the draft. For some reason, I have an odd suspicion that the Jaguars will be VERY active in free agency this year. Pay specific attention to the WR, FS and MLB positions and of course we will probably pick up an OL. The time is now…..let’s get started!